Center for Behavioral Health Statistics and Quality. Results from the 2016 National Survey on Drug Use and Health: Detailed Tables. Rockville (MD): SAMHSA; 2017. https://www.samhsa.gov/data/sites/default/files/NSDUH-DetTabs-2016/NSDUH-DetTabs-2016.pdf. Accessed September 14, 2017. Centers for Disease Control and Prevention. Wide-Ranging Online Data for Epidemiologic Research (WONDER). Atlanta, GA: National Center for Health Statistics; 2017. http://wonder.cdc.gov. Centers for Disease Control and Prevention. Understanding the Epidemic. https://www.cdc.gov/drugoverdose/epidemic/ Accessed June 4, 2018. Dahl RE. Adolescent brain development: a period of vulnerabilities and opportunities. Keynote address. Ann N Y Acad Sci. 2004;1021:1-22. doi:10.1196/annals.1308.001. Kessler RC, Berglund P, Demler O, Jin R, Merikangas KR, Walters EE. Lifetime prevalence and age-of-onset distributions of DSM-IV disorders in the National Comorbidity Survey Replication. Arch Gen Psychiatry. 2005;62(6):593-602. doi:10.1001/archpsyc.62.6.593. Thornberry TP, Krohn MD, eds. Taking Stock of Delinquency – An Overview of Findings. New York, NY: Springer Science & Business Media; 2006. //www.springer.com/us/book/9780306473647. Accessed November 7, 2017. Johnston L, O’Malley P, Miech R, Bachman J, Schulenberg J. Monitoring the Future National Survey Results on Drug Use, 1975-2016: Overview, Key Findings on Adolescent Drug Use. Ann Arbor: Institute for Social Research, The University of Michigan; 2017. Muhuri PK, Gfroerer JC, Davies MC. Associations of Nonmedical Pain Reliever Use and Initiation of Heroin Use in the United States. Rockville, MD: Substance Abuse and Mental Health Services Administration; 2013. http://archive.samhsa.gov/data/2k13/DataReview/DR006/nonmedical-pain-reliever-use-2013.pdf. Substance Abuse and Mental Health Services Administration. Critical Drug Testing in Primary Care. Rockville, MD: Substance Abuse and Mental Health Services Administration; 2012. https://store.samhsa.gov/product/tap-32-clinical-drug-testing-primary-care/sma12-4668. Accessed November 7, 2017. U.S. Food and Drug Administration. Drugs of Abuse Home Use Test. https://www.fda.gov/MedicalDevices/ProductsandMedicalProcedures/InVitroDiagnostics/DrugsofAbuseTests/ucm125722.htm. Accessed March 9, 2018. NIDA. "Los opioides: Información para adolescentes." National Institute on Drug Abuse, 1 Jul. 2018, https://www.drugabuse.gov/es/publicaciones/los-opioides-informacion-para-adolescentes. NIDA. Los opioides: Información para adolescentes. National Institute on Drug Abuse website. 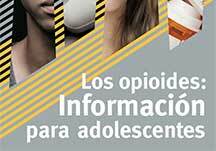 https://www.drugabuse.gov/es/publicaciones/los-opioides-informacion-para-adolescentes. julio 1, 2018.